The August Calendar of Events and the 52 Weeks of Online American Digital Archives and Databases: Mississippi posts will be delayed. This past week has been the busiest yet this summer since mid-June when I attended Jamboree and then came home to prepare for a family wedding. I've been kept busy with helping several family members with paperwork for their job searches/preparation for school, as well as my various duties as 1st Vice President of my local genealogical society. Today, especially, was a long, but fun one as our society co-hosted the Walking With Ancestors tours, displays, classes and barbecue with the local cemetery association. You can see photos of this event on my Facebook account (if you're already my FB friend) and also at the EWGS blog here. I'll get the posts up as soon as I have a chance to catch up on my rest! Thank you for your patience. 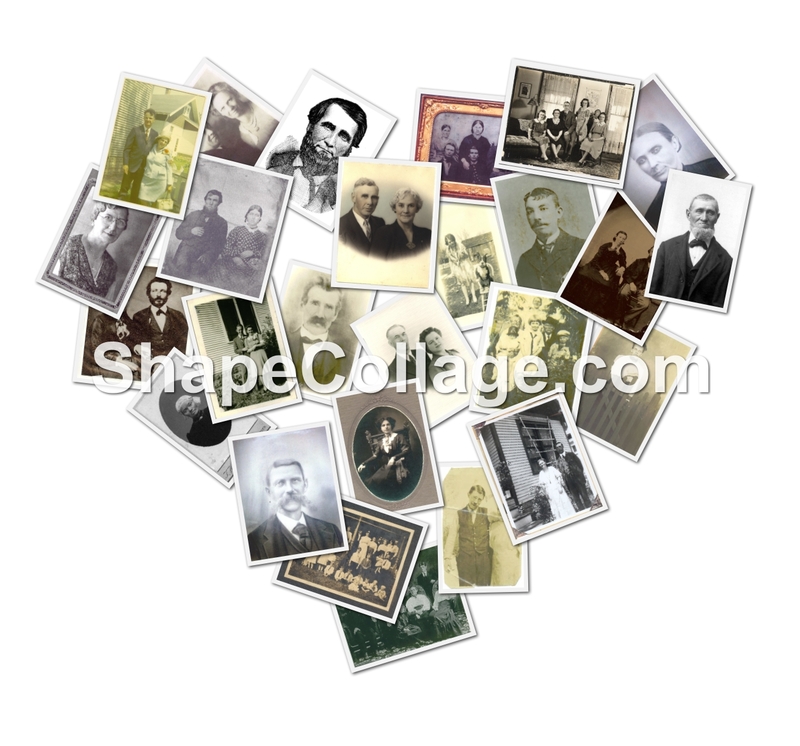 The great thing is, you can make text collages (think Family or Ancestors or your surname! ), add colored borders to the photos, use any shape, or even customize it to make all those photos create another photo of their own (you'll need a lot of photos to that!). For $25, you can upgrade to a personal pro product which will remove the watermark, create and save templates, and give you the ability to rotate, move and reorder photos within a collage. Doesn't this sound like fun? Now go on, get busy playing! And thanks, Randy! Video tribute of Robert David Midkiff, youngest brother of my husband. Created and copyright held by Mary Duncan, [ADDRESS FOR PRIVATE USE], Skamania, Washington. 2010. Used with permission. Grave of Mary Jane (Barber) York Curiston Keller Dunlap, Stiles Cemetery, Lapeer, Lapeer Co., Michigan. Photographed by Mary Jo Buchart, [ADDRESS FOR PRIVATE USE], Michigan and privately held by Miriam Robbins Midkiff, [ADDRESS FOR PRIVATE USE], Spokane,Washington. 2005. Mary Jane was my father's maternal grandmother. You can see that she was married multiple times. My grandmother and her brother were not raised by their mother; when they were very young, they were kidnapped by their father, taken across Michigan and placed in Blodgett Home in Grand Rapids, from where they were each adopted by two families in Coopersville in Ottawa County. You can read more about Mary Jane's life here. In tracing my family history and finding the birth family of my grandmother, which led to her subsequent reuniting with her mother's family, I am happy to say that she was able to visit her mother's grave here in Stiles Cemetery several years ago, before Alzheimer's took over her mind. 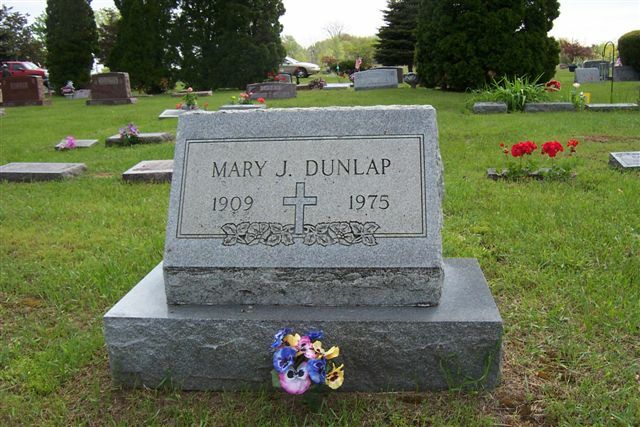 Grandma was also able to visit her grandmother's grave--Mary Jane's mother was also named Mary Jane. I will feature Mary Jane (FREDENBURG) BARBER DARBY SMITH KELLER's grave in a future Tombstone Tuesday post. Interestingly enough, Mary Jane DUNLAP's first husband, Howard Merkel YORK--my great-grandfather--is also buried in this cemetery, in an unmarked plot. I discovered this after finding his obituary and calling the funeral home mentioned therein. Unfortunately, there was a fire some 30 years ago in the township office, which destroyed the burial records of Stiles Cemetery, so to my knowledge, there is no way to determine where exactly Howard is buried. This is the 24th post in a weekly series of Online American Digital Archives and Databases found for free at state, county, municipal, college and university history, library, and archive websites, as well as public and private library and museum sites, and historical and genealogical society sites. Minnesota Historical Society - http://www.mnhs.org/index.htm - What's not to like? It's hard to find a page on this site that doesn't have some amazing information about your Minnesota ancestors. I recommend using the following tabs at the top of the page to start out your searches: Family History, People, Places, and Collections. Included in these are birth and death certificate indexes, state censuses indexes for 1865, 1875, 1885, 1895, and 1905, online maps, newspaper collections, veterans graves indexes, Minnesota History index, Governors of Minnesota, Christie Civil War Letters, Chinese-Americans, Building and House History, Author Biographies, Minnesota Photographers directory and much, much more! CLIC Digital Collections - http://content.clic.edu/ - a non-profit federation of the libraries of eight private colleges and universities in Saint Paul and Minneapolis, Minnesota...The collections you find here are widely varied and continually growing, and include audio, visual, and textual resources." Includes Augsburg College, Bethel University, St. Catherine University, Concordia University, Hamline University, Macalester College, Northwestern College, and the University of St. Thomas. College of Saint Benedict - Saint John's University Digital Archives - http://www.csbsju.edu/CSB-Archives/DigitalArchives.htm - books, lists, maps, photos, non-book publications, visual resources. Also check out Vivarium at http://www.hmml.org/vivarium/, the online digital collections. Gustavus Adolphus College - College and Lutheran Church Archives - http://gustavus.edu/library/archives/ - while there is not much data on this site (includes WWI posters and the Gustavian Weekly, 1979-2005), it is a necessary stop if you had Lutheran ancestors because of the finding aids, biographical index, and a microfilm index of church records. St. Catherine University Digital Collections - http://images.stkate.edu/ - drawings, writings, fine art and photograph collections; also links to digital scans of their publications: The Catherine Wheel, Pot Pourri, The Magret, and Ariston. Hopkins Historical Society - http://www.hopkinsmnhistoricalsociety.org/ - photos and a transcription of an 1872 local farmer's diary. Joint Archives of the Great Northern Railway Historical Society (GNRHS) and Northern Pacific Railway Historical Association (NPRHA) - http://www.gn-npjointarchive.org/default.aspx - digital archives of station plats (all along the railroad, not just in Minnesota! ), structure drawings, bridges, depots, photos, drawings, charts, and maps, rosters, and more! A must-visit site if you have railroad employee ancestors! Wayzata Historical Society - http://www.wayzatahistoricalsociety.org/ - check out the timeline under the Photos tab! What a great educational resource! There are historical and "mystery" photos, an architectural survey, and newsletters. Check out my Minnesota Online Historical Directories and my Minnesota Online Historical Newspapers pages.